BEN Hunt is one of the NRL's highest paid players, but at the moment his numbers just don't stack up. The price tag that came with his $6 million move from the Broncos to St George Illawarra this year had plenty of pundits raising their eyebrows. And those doubters will be wringing their hands when they see this stunning - and perhaps embarrassing - stat from the Dragons' shocking round-22 loss to Parramatta. The Red V were walked all over by the Eels, losing 40-4 to a side that could still claim the competition's wooden spoon this year. And Hunt's numbers left a lot to be desired. The Origin halfback did not run the ball once, according to Fox Sports Lab. That's zero runs, for zero metres gained, in what was a day to forget for the man earning about $1.2 million a year to play footy. Hunt also missed a game-high six tackles, had an error, and missed his only conversion attempt. To his credit, he did assist in the team's only try. Still, for a playmaker on that sort of coin, Hunt will be relied upon by the Dragons to pull them out of the form slump they find themselves in. Hunt's halves partner, Gareth Widdop, also registered zero runs for zero metres, and missed three tackles. 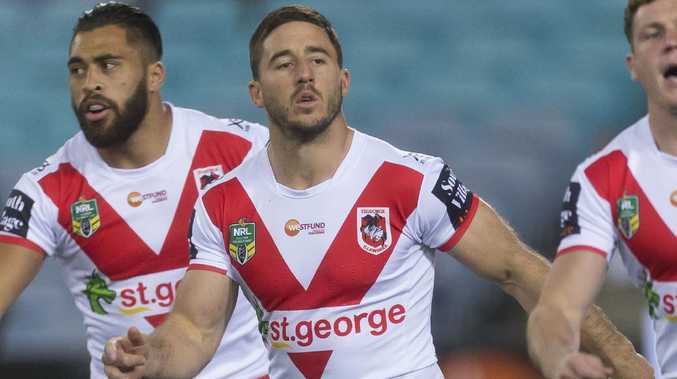 Widdop was on the field for only 27 minutes before injuring his shoulder - putting the remainder of his season in jeopardy. With Widdop in the casualty ward, the weight of the Dragons' attack falls completely on Hunt's shoulders. If he continues to throw up the kind of numbers he produced on Saturday, the club won't be sticking around too long in September.